Thoughts: A joyous curio of a strip to round of the first 25 Future Shocks. Charles Swift is presumably a pseudonym, perhaps of one of the illustrators of the strip. 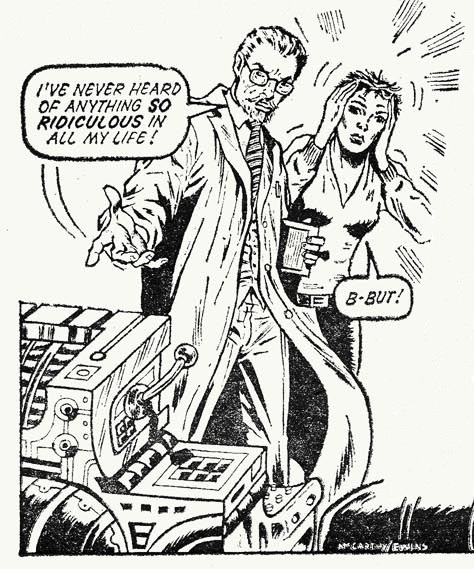 Sadly his one and a half pages of 2000AD fame are marred by the repetition of a rather obvious grammar mistake (the direct quote above) but our presumably fictitious friend does leave us with a rather nice simple gag strip. The second page is composed entirely of repeated copies of the last panel from the first page as the two scientists are now trapped in stasis by the machine. Actually they appear to be trapped in a loop rather than stasis but we’ll indulge them that given the eternity of their fate. The art also proves a small conundrum with the familiar ‘which McCarthy Brother was it’ dilemma. The strip lists ‘McCarthy’, Barney lists Jim McCarthy whereas Brendan McCarthy claims it as his own on his website’s bibliography. Which ever way they divided up the chores, the art certainly is an improvement over their previous work and hopefully the young artists got a full-page rate for a cheeky ten minutes with a Xerox machine on the second page. Shock’d? More of a Future Chuckle than a shock but the strip is definitely a successful one-note gag. I believe its Brendan and not Jim, as far as I know Brett Ewins didnt start working with Jim until the Anderson and the brilliant Bad Company. I’d vote for it being Brendan too, the male figure in the illustration i’ve used really screams Brendan to me (the face and hand are just nailed beautifully and remind me of his Dr Strange) but one doesn’t like to doubt the Barney too much. The excellent Brett Ewins interview in Meg 313 really does strongly suggest they were all dabbling in each others work but that Brendan and Brett did the early Shocks together.